*Thriller cradled* "Naomi, please answer what happened, to you and Tsu?" "Breach..." Naomi's voice scratched like sandpaper. "Door... gone... need to get to lobby... NOW. Up stairs. Door will close. We die." She drew breath painfully, fighting to stay conscious. ooc: uh, Tsu? You triggered the fate awaiting D7 (which is why she hasn't tried to breach the door directly). Body and soul, nothing. OOC: oh lol,didnt know that..........i was gone half of the time,so i missed alot though.So all the characters die now? Tsuyoi tekikoku wrote: OOC: oh lol,didnt know that..........i was gone half of the time,so i missed alot though.So all the characters die now? ooc: Not if they go back up the stairs before the top door seals. I'm sorry, Tsu, but there really are very few people (mostly newcomers) who don't know what Swith is. Your exact words after Swith warned you were, "OOC: swith you know tsu's gonna do it anyway". However, it was breaching the door that technically killed Tsu. The door leading to the stairwell slammed shut with a hiss as the atmosphere behind it was sucked into the vacuum of space. Naomi groaned again and trembled. She looked at Thriller (whom she didn't recognize) and at Superbia. "I couldn't... stop... why did she? Locked in for reason..." Naomi began to weep, burying her face in Thriller's chest. Last edited by Swith Witherward on Thu Nov 01, 2012 9:07 pm, edited 1 time in total. OOC: oh yeah forget,well im gonna have to make a new character to replace tsu. Naomi's tears tapered off slowly but she still kept her head buried. "It's all my fault. I'm weak. I'm sorry, so sorry." She curled against him like a small child and trembled. Swith Witherward wrote: Naomi's tears tapered off slowly but she still kept her head buried. "It's all my fault. I'm weak. I'm sorry, so sorry." She curled against him like a small child and trembled. "Child, child, it's not your fault. Rather my fault. I told her to open the door, I told her to lead the way... It's my fault, i'm the one who should be sorry." "nemisis walks threw the front lobby"
This place...........it isnt normal....................Tsu.....power is gone......................"nemisis looks around looking for tsu's room"
"No," Naomi shuddered, "It's this building. It's the Drone Empire and that damn security system. It's Swith. I hate them." "Drone Empire? Who are they? Secondly, what's Swith having to do with any of this, why do you hate her?" "nemisis picks up a family photo of tsu and her sisters with the strike ops raiders and nemisis herself in the photo and also picks up a dinosaur toy"
Tsu's favorite toy...............Mr.Rexy.............I remeber giving this to her.........she loved it so much"nemisis sherds a tear and hugs the toy close to heart chest"
Papal Inquisition wrote: "Drone Empire? Who are they? Secondly, what's Swith having to do with any of this, why do you hate her?" "D-drone Empire, the other cyborgs. Trying to take over world. Not the male cyborg; he's an emperor and nice, not a Drone," she hiccuped, keeping her face buried in his shirt. "I'm a vessel. Swith was in a rage and didn't want to harm someone so I bore her anger. It's why I exist. But now Tsu..." Naomi shook her head and began to sob again. "Sweety, you know who I am right? I am that male cyborg. The immortal Emperor." *He said with a soft smile* "Now as for the rage thing, I think that was wrong of her to cast that on you." OOC: Last post night. check around 5 or 6 am. "nemisis begins walking back donwstairs,as a tsuyoian V-22 Assault SOAV Osprey lands dropping off the strike ops raiders who bursted in the lobby"
"the strike ops raiders dropp their weapons looking at each other"
Your lying nemisis! tsu isnt dead! took care of me as if i was her own child..
Papal Inquisition wrote: "Sweety, you know who I am right? I am that male cyborg. The immortal Emperor." *He said with a soft smile* "Now as for the rage thing, I think that was wrong of her to cast that on you." Naomi raised her face and looked into his human one, not understanding. "How?" She shook her head. "You don't understand. I'm the part that decided to bear the emotions, to help NVE." Her hand touched his skin, and the puzzled look returned. "How are you human? You're... you are Thriller?" Swith came down the stairs and noticed the sealed door and Triller on the floor, holding Naomi. She sighed. "Let me have her, Thriller. I'll take care of her." "the strike ops raider with broken hearts and souls got back into t he osprey and left,as nemisis cheered up realizing tsu wouldnt want her to be sad"
User.........Told to replace tsu,Then ill replace her"Nemisis looks around"
But i dont know anything but the people here! "does this happen often? if so im gonna need a bigger gun" says Victor holstering an ornate gun. "is anyone hurt and can someone clue the new guy in on your freak relation ship Hecatonicosachoron"
Last edited by Primordial Luxa on Thu Nov 01, 2012 9:57 pm, edited 2 times in total. Swith lifted Naomi out of Thriller's embrace. "Thank you for comforting her, my friend," she said, bumping her head against his shoulder to show her appreciation. She looked at the human and sighed. "I hope you keep this body another few days. I've tried to let you experience coffee, but now you can taste it for yourself. And waffles, Thriller, don't forget those. Besides, you're a fairly handsome man without all that metal." Naomi folded her arms around Swith's neck and wept softly as Swith carried her up the stairs. Primordial Luxa wrote: "does this happen often? if so im gonna need a bigger gun" says Victor holstering an ornate gun. Swith tucked Naomi into bed, stroking her hair and singing Bran's song to her. She didn't have a stuffed gun to offer her, so she propped a throw pillow under her arm. "Alright, Naomi. I thought you'd be safe in the shelter, but I was wrong. You did well; you've done nothing wrong. This isn't your fault." She kissed her cheek and drew the girl's sorrows and pain into her, blighting out the memory completely. Swith returned to the lobby and cracked open the door at the top of the stairs. The apartment's door far below had regrown and no traces of the implosion remained. The spiritual energy was still very present, a wash of prismatic hues visible to gods and demons alike. The door opened itself at her touch and she walked into the apartment. Litter was strewn all over the floors. Her favorite couch was turned over and her coffee table smashed. She paced the area where Tsu had been, feeling out the attack that had ended her life. Her fingertips moved through the invisible strands of the universe, touching the fibers and sensing what had transpired. "Perhaps," she mused. "If Naomi had been strong enough... perhaps." "tsu still in sleep mode in her ice block"
The chopper was near the base, Bran brought his Ka-65 into a hover and waited for one of the Mon's to tell him what to do. He also kept his left hand on the radio in-case anyone happened to want to know what they were doing in the area. Bran broadcast to the rest of the chopper. "We're here!" Natiya (Again) had fallen asleep slumped over a kitchen table, hand dipped in Coffee. A large explosion could be heard as the Su-37 Terminator slammed into a vacant whipped cream factory across the street. The pilot was parachuting down and was caught on the balcony of one of the rooms above the front door of the apartment, she dangled there while trying to read a newspaper she had taken with her. 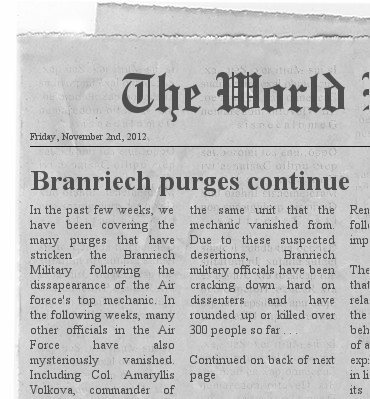 Last edited by The BranRiech on Fri Nov 02, 2012 5:21 am, edited 1 time in total.